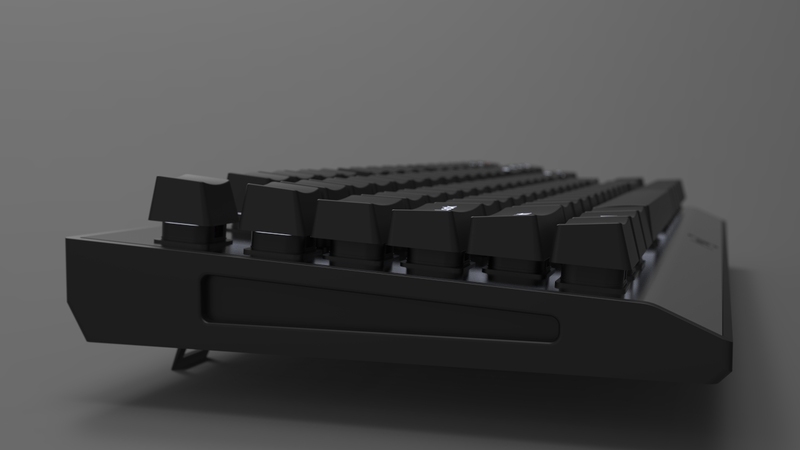 We’re very excited to show you our next generation mechanical keyboard design. It’s nothing revolutionary, but definitely a feast for the eyes! So sit back and enjoy this intimate moment with your upcoming keyboard. Ok maybe I’m a bit over the top, but we’ve made some interesting design choices, that we’re going to talk you through. We’ve bulleted the essentials, and elaborated underneath it. Go through it however you like. Be critical, be harsh, but be fair and share your opinion with us. I also want to note, that we’re not covering any of the distinctive (core) features, but solely focus on the keyboard design. Without further due, lets start with a 3D photo realistic render. In our previous blog we explained that we’re aiming for; a no-nonsense and clean design with gaming at its core, that you can use in both home/private setting as in a public/office setting. We believe our design hits that balance between playfulness of a gaming keyboard and professionalism of a raw mechanical keyboard. So lets break it down. We’ve designed the keyboard as simplistic as possible without becoming a standard mechanical keyboard. We also wanted to optimize it for aesthetic customization; therefore added a border from the bottom case around the entire keyboard, imagine changing the color. Gaming use: As gamers ourselves, during long gaming sessions with full sized keyboards it would end up skewed to make space for all our mouse movements and close hand-to-hand positioning. Also when we analyzed which keys we’d actually use during gaming (and in-game typing) we were able to drop everything starting right from the Enter key, but everybody has his own preference. Especially for Professional use, we noticed that everybody has his/her own way of using a keyboard. What may seem useless keys to some people, are still essential to others. Therefore we couldn’t start throwing out all the keys, besides we’re not developing a new standard. 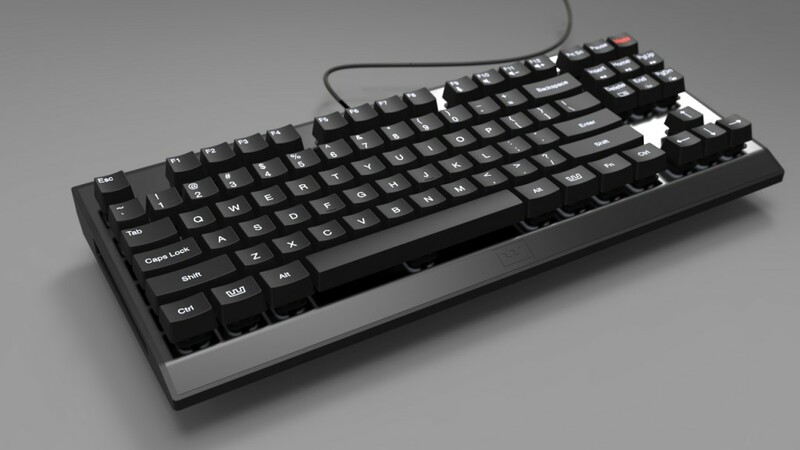 We felt that a TKL keyboard would hit the right balance between useful keys for gaming and typing/coding. These choices came from our mechanical keyboard fan-side. The floating keycap give that modern look to it, and slight gamer aspect. Besides, it’s easy to clean; you don’t want to start harvesting creatures of the dark in your keyboard with all the crap that drops in between. We’re big fans of artisan, customized or replaceable keycaps and believe it can give your keyboard more character. We concluded that an ANSI US-layout keyboard with cherry MX mounts would provide the highest amount of keycap compatibility. Note: This doesn’t mean we’re using Cherry MX, or Chinese copy switches. The real challenge for us was to find a good balance between a gaming and professional mechanical keyboard while creating our identity design. As you can see from our brand, it’s quite simplistic with strong corners and thick lines. We felt that the keyboard had to resemble this without becoming too rugged. The bottom speaks for itself, we didn’t want to add too many frills and only add the essentials. As you can see it has anti-slip on the corners, flip feet with anti slip and a detachable USB cable that can be routed in the back of the keyboard. Let’s play a Dora game. Next week’s topic will cover the function keys and other special key features. Until then, can you figure out what every function key does? Leave a comment below. 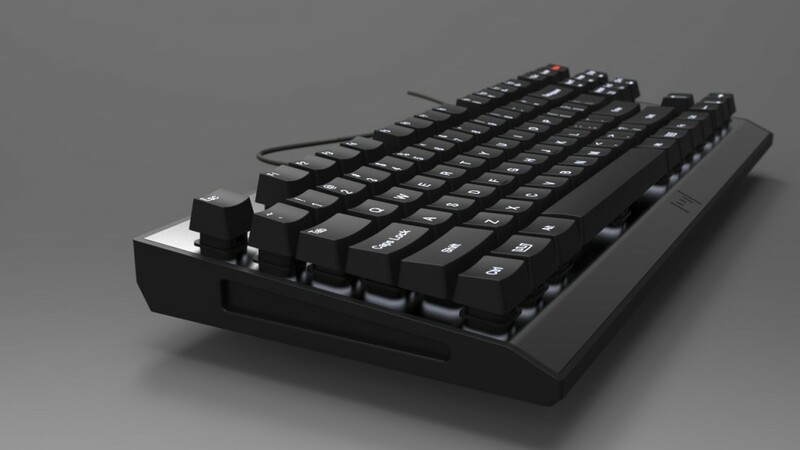 We’re really excited about the keyboard design, and hope you have mutual feelings about it. In either case be critical, be harsh, but be fair and share your opinion with us. This just looks like a Corsair K65. What are the differences? Yes there are a few similarities with the k65, metal top plate and plastic bottom case. The design is really different, our metal plate doesn’t cover the top completely and we don’t use dedicated media keys (they only absorb space). Also our top plate is “Flat” and doesn’t have a bump where the keys are. We’re able to add a whole new dimension to the keyboard that hasn’t been done before (mode key). At this moment I can’t discuss or reveal the specifics, but we’re releasing more information by the week, so keep an eye out on the blog. Hello! Wondering when this comes out, and if its out, is there anywhere to order one? Also, (it probobly says all of this somewhere on the page and i’m blind )What will they cost? Thank you for taking such an interest. Actually you’re not blind. We’re currently constructing a clear information page that will summarize everything that we’ve announced. 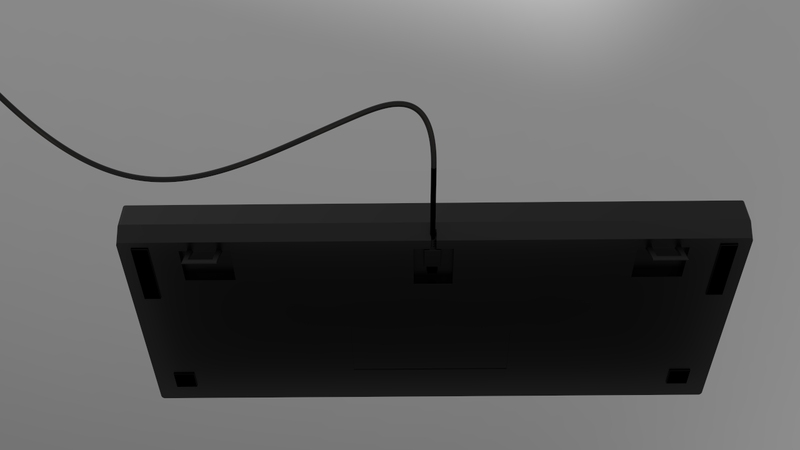 The keyboard is still in heavy development, and have yet to announce an unique and important feature that will set this keyboard apart from others. The official sales price hasn’t been formulated yet, as we don’t have adequate information at this point, but you don’t have to expect an overrated premium price. Keep an eye on the blog, perhaps subscribe on http://www.wooting.nl or follow us on twitter: @wootingKB and things will become clearer by the week. As mentioned this looks a lot like a Corsair keyboard, and now there will be even stiffer competition in that area with the new MX Silent switches that are exclusive to Corsair for the time being. In forum posts you’ve talked a lot about “useless” keys, many of which I agree with (though most key functions still need to be accessible on a secondary layer) . That being said I think it would really start setting you apart to dive head first into the layout and changing that up, because as it stands unless the Mode key really works magic and is different than a normal “FN” key I’m not sure where it will fit in. When the keyboard layout is properly reconsidered wonderful things to happen though, just look at the HHKB. Excited to see what is revealed next. Thanks a lot for leaving your input. You’ve made some valid points, and we can’t deny that Corsair is playing the game smart, especially considering their short history with pheripherials. Thankfully we’re not aiming to compete with them, or similar brands head-on. Too add on that. There are different reasons why we’ve not announced all the features at once, particularly the most distinguishing ones. One of the reasons is that we don’t want the community (whom we rely on feedback) to lose focus. It’s interesting how you talk about the layout and Fn function. 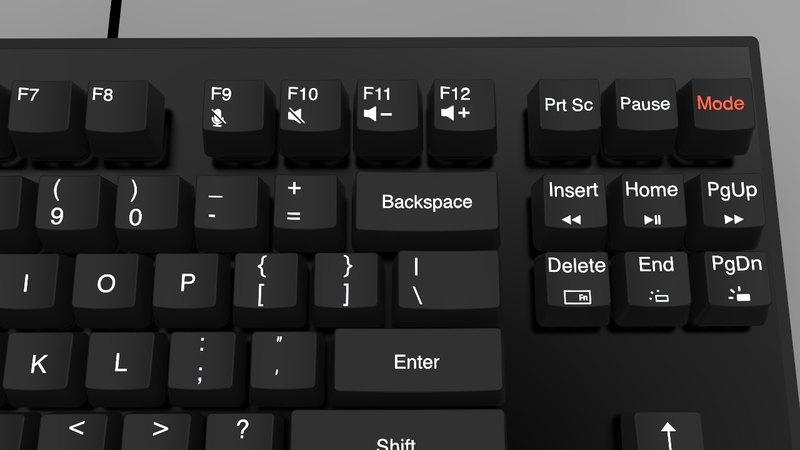 The next blog will feature our initial take on the Fn key and keyboard layers. I can also already tell you that the mode key is not a modifier/Fn key. It will actually activate something. Our aim however is total customization. We’re building the keyboard from its core up, we code our own firmware, so there is a lot we can play around with. This is a different topic however, that we’ll cover in one of our feature blog. Thanks again and Stay tuned. Thanks a lot for featuring us on Keychatter.com, much appreciated Livingspeedbump. We can’t deny that Corsair is playing the game smart, especially considering their short history with pheripherials. Thankfully we’re not aiming to compete with them, or similar brands head-on. Additionally, we’re not focused on extra “frills” on the keyboard and don’t want to compete on the best RGB lighting keyboard there is. That’s not next generation for us. Instead we’re focusing on the things that can actually make a difference in your keyboard experience. You’ve noticed by now, we’re not doing it from an ergonomics standpoint, that’s been done before in many different ways, but it seems impossible to adopt a new standard. Now there are different reasons why we’ve not announced all the features at once, particularly the most distinguishing ones. One of the reasons is that we don’t want the community (whom we rely on feedback) to lose focus. We believe a next generation keyboard can’t be dictated, but should be forged out of the community of enthusiasts, while considering the limit of the masses. We believe this starts with a keyboard that at first glance is optimized and understood by the masses, but once you look under the hood, it provides a wide range of options for the enthusiasts. And yes, the mode key has, among others, one very unique trick up its sleeve that we will announce when it’s ready. following Andy/keychatter i found my way here. I love floating keys and minimalistic design. You could even make me more curious and interested if you would even go further in minimalism and save another 2 or 3 percent of the topplate and go phantom with little cutouts for easy switchmoding for my own liking. This would be a niche many people wont be able to resist! Thanks for your input! I’m happy you’re digging the minimalistic design. We’ve considered even going further down the minimal path, but in the end it would influence some of our other ideas for this keyboard. So we felt this gave the right minimal impression, while keeping our options for other (to be announced) features. Perhaps you should have utilised new Optical Switches instead of still using the conventional MX switches. Thanks for your suggestion, but actually we’ve not announced what switches we’re using other than using MX mountable keycaps. I know this limits our options, unless we have our own trick up our sleeve. well played, we’re so used to Cherry (clone) switches, that it’s a misunderstanding easily made. Call me even more curious, i hope there will be options in switchstyle. Misschien moet je Facebook ook gebruiken bij “Share your opinion” . Vooral omdat volgens de publicatiecijfers twitter naar beneden gaat en facebook alsnog verschrikkelijk veel wordt gebruikt. Als je nog meer advies hebt, dan is het altijd welkom. Ps; ben ook wel stiekem benieuwd naar de publicatiecijfers. Awesome! Sounds good. It seems like you have a good grasp on the market and that you are actually going to do something new and innovating, without just taking the best features of current keyboards and mashing them together. Excited to see what is revealed next! Appreciate your opinion. I’m very happy we gave this impression, because that’s exactly where we’re heading. Completely unergonomic. Keys are place too high up from resting surface, and with too much travel. This design will give you carpal tunnel syndrome in a short time. At the moment we created a few prototypes with this design, and (this is my opinion) It feels great and I can type on it for hours and not have cramped feeling. Take a look at the newer design :). I appreciate your feedback, and ergonomics are high on our priority list. level? Any insight would be greatly appreciated!